Turn on your oven grill on high. Cook gnocchi according to packet directions. Drain and transfer the gnocchi to a baking dish. Heat the butter in a large saucepan over medium heat. Add the flour, garlic and chilli flakes, then stir until the mixture thickens and starts to bubble. Remove the saucepan from the heat and whisk in the milk. Return the saucepan to the heat and continue whisking for 4-5 minutes, until the sauce thickens. Stir through mushrooms and spinach. Once the spinach is wilted remove from heat. Pour the sauce over the gnocchi, and stir through the cheese. Place the baking dish in the oven under the grill for 5-10 minutes until cheese has melted and starts to brown. 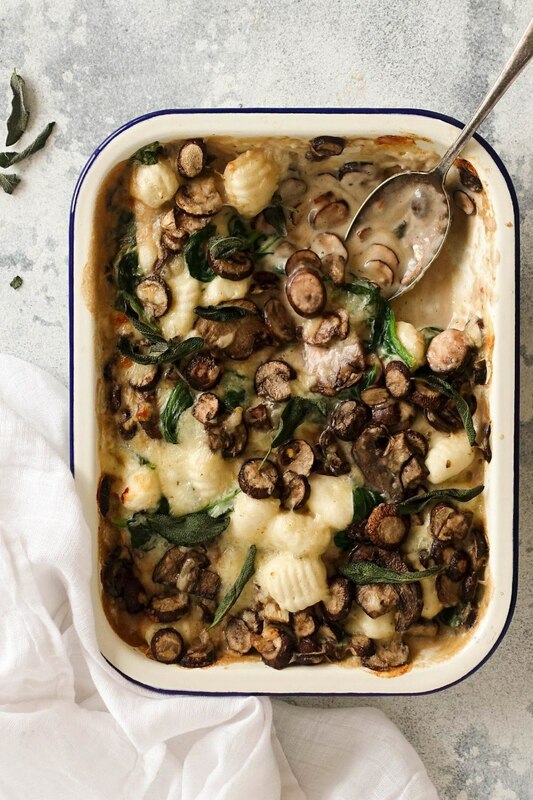 Divide the gnocchi bake into 4 portions and serve with a side of mixed leaves. If there’s leftovers, pop them in the freezer in an airtight container.